The carry-over filter is a two-layer filter. The top-layer is anthracite and the bottom layer is sand. In the pellet-reactor the calcium is removed from with a chemical reaction. Most of the calcium is deposited on the sand. Not all of the calcium settles on the sand, some calcium will be suspended in the water. The carry-over filter will catch any suspended particles. The advantage of the anthracite is that it is light, and during the back-wash it will be in expansion. If the anthracite is in expansion, the "dirt" can be easily removed. 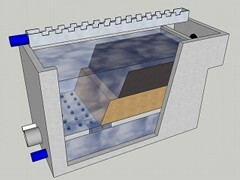 Look at an video presentation of a carry-over filter.